If you live in California, you are most likely aware of the new law requiring everyone over the age of 18 to use a hands free device to talk while driving. There’s a huge market of people looking to purchase a Bluetooth headset to accompany their mobile phones. To curb the tensions of looking for a compatible device, Verizon Wireless has released the LG Decoy which features a built-in pre-paired Bluetooth headset. I personally felt the idea was quite interesting, however there are plenty of pros and cons to discuss. This phone may be suitable for some, but definitely isn’t for everyone. The LG Decoy looks sleek, with only four buttons (two programmable buttons, a “Speaker” button and a “Clear” button) and a joystick on the front. 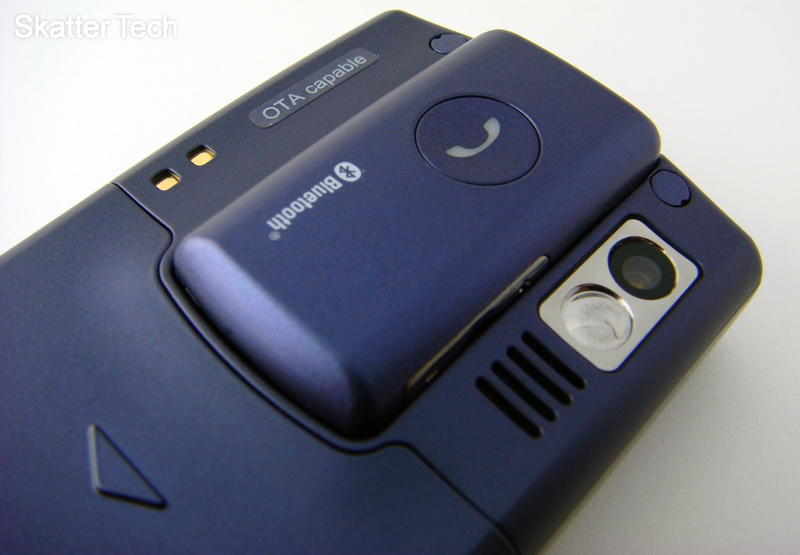 The back of the phone houses the Bluetooth headset, which makes a bulge, and to the right of the headset is the 2MP camera. The right side of the phone has a camera button, microSD slot, and a 2.5mm headset jack. I have no idea why they added a 2.5mm headset jack considering that one would purchase this phone to use with the Bluetooth headset. A 3.5mm jack for standard headphones would have been a better choice. The left side has two volume control buttons and a microUSB port. The only other folly might be that it is difficult to slid open the phone to access the keypad. There is no way easy way to slide the phone open without touching the joystick in the middle or touching the screen, unless you want to get more fingerprints all over it. With regard to the brightness, contrast, and color representation, the display is excellent. The Decoy’s 2.2″ screen can display a 320×240 pixel resolution, which has been approximately the standard for the past few years. Unfortunately due to the high amount of “glossy-ness” of the whole front of the phone, the display becomes extremely difficult to read in direct sunlight. In addition, you’ll find yourself constantly wiping down the phone since it is literally a fingerprint magnet. But with regards to the display, if you are in doors, you probably won’t have any problems. The LG Decoy has a slick user interface, the menu has only nine categories, however, you can dig down into the sub-categories and change and settings, send messages, media playback, recent calls, etc. The menu also has a nice feature where even after you’ve dug into a certain category you can change to a different one simply by moving the joystick left or right. The transitions to additional options when trying to, say, add another recipient to an SMS message, are subtle but create an overall better experience. The LG decoy supports the following codecs: MP3, WMA, AAC, and AAC+. Controls are pretty simple to use, with the joystick controlling most of the functions, such as play/pause, fast forward, rewind, next song, and previous song. The volume is controlled by the two side volume buttons, which are also used for increasing call or ringer volume. Sound quality is not exactly great when listening through headphones, but is better than the speakerphone quality. Though I would not recommend this phone as your primary music player, when on the go and nothing else is available, it will suffice. The LG Decoy supports up to 8GB microSD cards, which should be more than enough space for the majority of users. Syncing music onto the phone is easy; just drag the files onto the card. 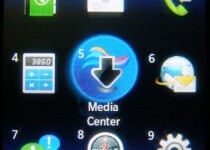 You can either use a micro-USB cable and sync content using a program such as Windows Media Player 11 or use a microSD card reader to copy content into the automatically created folders on the card. The phone will automatically index the added content before beginning playback. Looks like LG dropped the ball on the speakers for this phone. They start to crackle at about 60% volume and voices become high pitched at 100% when using the speaker phone. It was much worse than I had expected out of a phone. 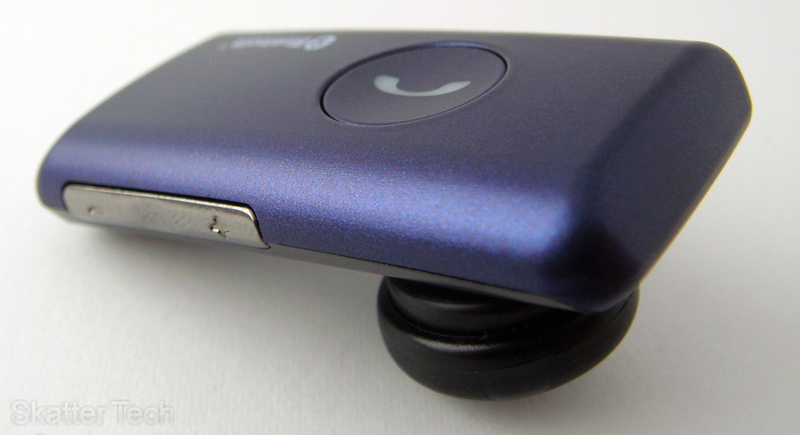 The Bluetooth headset, which is pretty much the defining point of this phone was utterly atrocious. It is extremely difficult to get the earpiece to fit comfortably in your ear. If it fits you’re lucky, however if it does not you are out of luck since no extra sized earpieces are included. The quality wasn’t exactly to great either. Overall the entire implementation was poorly execute. Another thing to keep in mind is that there’s a big ugly hole on the back of your phone when the headset has been removed. It looks as though something broke off your phone. The LG Decoy has a 2 megapixel camera which doubles as a camcorder. Photos can be taken at a max resolution of 1600×1200 pixels, while videos can be taken at a max resolution of 320×240. The camera has many different options such as a timer, white balance, a night time mode, and even color effects such as negative mode, sepia, and black & white. There is about a five second delay from when you hit save and when you can take the next picture, so you’ll have to wait if you want to take lots of pictures in a row. The camcorder can record up to an hour of video on the microSD card, however only 30 second clips can be sent. The VZ Navigator is probably the coolest feature of this phone, despite not being unique to the Decoy. The interface for the VZ Navigator, now on version 4.11, is simple and intuitive. The performance was surprisingly fast; it found my location in about ten seconds. It could even locate all the movies playing at every theater in my area and even show traffic conditions. The VZ Navigator also offers turn-by-turn directions with voice overs so it can be an extremely useful tool while driving. 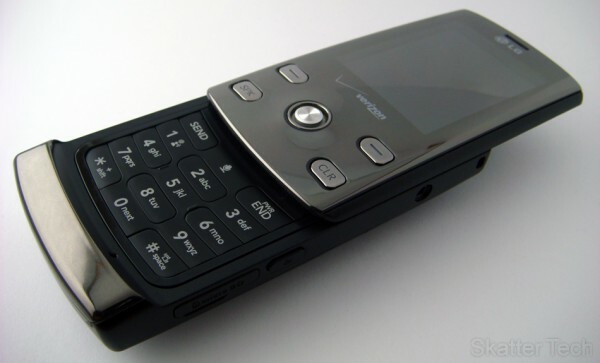 This is not the best phone for texting since it does not have a QWERTY keyboard, but people will manage to use it for that purpose anyways. 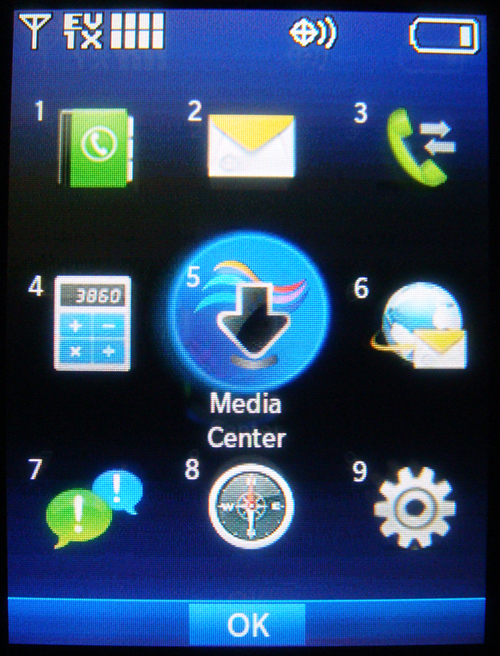 Mobile IM supports AIM, Windows Live Messenger, and Yahoo Messenger. Regrettably the web email function only supports MSN Hotmail, AOL Mail, and Yahoo Mail. The lack of Gmail support was disappointing. 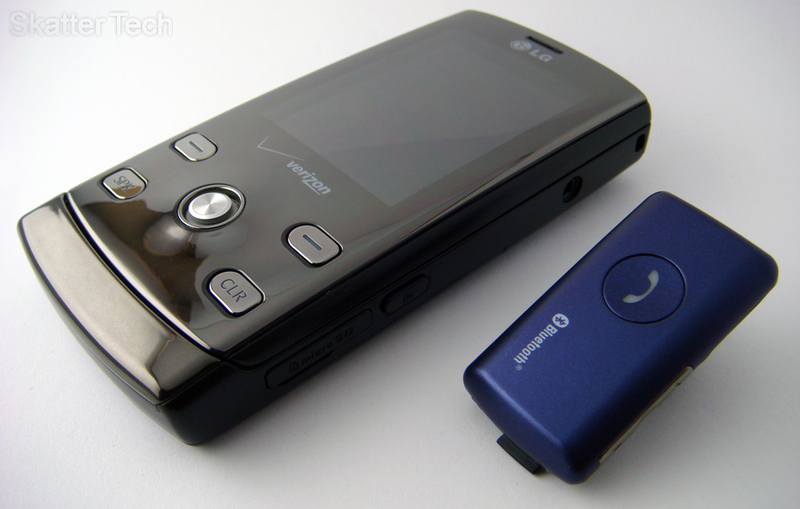 The phone lacks the Mobile Email client which most Verizon Wireless phones now have. Despite all that this is a pretty basic phone for messaging. If you are a heavy texter, you might want to consider another phone. This is a fairly mediocre phone and I wasn’t too impressed by what it had to offer. I do give them credit for begin implementing the concept of integrating a Bluetooth headset into the phone. The idea was great, however more effort should have been placed into making this a better phone. In addition a higher quality Bluetooth headset, possibly with noise cancellation, would have turned heads towards this product. For the price of $200 you can get a phone such as the LG Dare which has much more to offer in just about all aspects. My recommendation, however, would be to purchase a better phone and quality Bluetooth headset that fits your ear separately. If you are seriously interested in a phone with a built-in headset, this is the way to go. This phone is now available on Verizon Wireless’s website and in Verizon Wireless stores for $180 with a 2 year contract.